A multi-photo is like a photo post, except just with multiple adjacent photos, either in a series, or tiled / arranged in some layout. photos interspersed with narrative text, use an article instead. someone else’s photos, use a repost instead, or at least wrap it in an h-cite. See Instead use for more on posts similar to multi-photo posts. Sometimes you might have several photos that seems like part of the same thing, and thus make sense when published all together, with a single description/caption. There are many posts that have multiple photos or other images in them, despite that, they are not necessarily "multi-photo" posts, they are often something else. If your photos are interspersed with text, especially narrative text, you're writing an article that happens to contain photos. Your post as a whole is not just a "multi-photo" post. If your photos are specifically delimited by their own captions (or person-tags), e.g. photo1, caption1, photo2, caption2, etc. then you're essentially posting a collection of entire photo posts, since each photo(n) + caption(n) pairing is its own photo post. Use collection instead. Post each photo(n) + caption(n) as its own singular photo post at its own permalink, and include them all in a single collection post. If your one or more photos are in a set with one or more videos, then you need to use a collection to distinguish separate photos vs poster images for the videos. Use collection instead. Post each photo or video (with optional poster-image photo) as its own singular post at its own permalink, and include them all in a single collection post. Use repost to repost the permalink where the author of the photo published it themselves. OR if the author has no original, then cite (using h-cite) the photo as part of your post. Otherwise if you just use u-photo directly yourself to embed someone else's photos or artwork, since you're the author of your post you're implying they're your photos, that you photographed them or drew them which is kind of like plagiarism. Like a photo post, but with multiple "u-photo" images. If you have more than 4 photos in your multi-photo post, you can try POSSEing them to Twitter four at a time in a tweetstorm, e.g. no known examples of POSSEing a multi-photo to a Facebook multi-photo post, though it should be theoretically possible. Sorted by earliest multi-photo posts first. Kyle Mahan has been posting multi-photos since 2014-06-29. Uses Swarm iOS client to post photos at their locations (checkin venues) soon after he takes them (since 2017-03-30, instead of Instagram 2015-352…2017-085). Writes & posts a note on his own site that starts with a direct width960 .jpg URL of the photo image, then a space/linebreak, then direct original resolution of the .jpg URL, then at least one more .jpg width960 URL + .jpg original resolution URL, then caption. That "note" is auto-upgraded by CASSIS's auto_link function into a multi-photo post by putting the u-photo class name on the auto-embed <img> of the JPG, since it's the first URL in the "note", and auto-linking it with the subsequent URL, then including any immediately subsequent JPG+URL pairs into additional u-photo embeds. Falcon automatically uses Bridgy Publish to POSSE the multi-photo as a photo post to both Twitter (first 4 photos per their limit), Facebook (only the first photo per limit), and Flickr (same one photo limitation), saving the resulting syndication URLs in storage. Uses Instagram iOS client to copy caption from original post, and manually choose and post same photos in the same order as in original post. Manually copy new Instagram multi-photo post permalink into original post as a syndication link. Uses Instagram iOS client to post a (multi-)photo there. Writes & posts a note on his own site that starts with a direct .jpg URL of the photo image, then a space/linebreak, then permalink of the Instagram post (auto-generated using the Instagram Bookmarklet), then at least one more .jpg URL + permalink, then caption. Falcon automatically uses Bridgy Publish to POSSE the multi-photo as a photo post to both Twitter (first 4 photos per their limit) and Facebook (only the first photo per limit), saving the resulting syndication URLs in storage. Malcolm Blaney uses dobrado and SimplePie on https://unicyclic.com to display multi-photo posts with a light box effect. The first photo found in the post is displayed, followed by a description containing the number of photos. Clicking on the photo brings up a light box and navigation options to view the rest of the photos. Aaron Parecki uses p3k to publish and POSSE multi-photo posts since 2016-08-06. If the post has two photos, they are both 50% of the width of the post and a fixed height. If the post has three photos, they are 33% of the width of the post, and a fixed height, smaller than the 2-photo post. If the post has four or more photos, they are 50% of the width of the post, and a fixed height, slightly smaller than the 2-photo but larger than the 3-photo. This post from 2009 was intended to be a "multi-photo" post, and was posted to Twitter, with three links to Tumblr posts. Monocle supports displaying multi-photos, and has a special layout for posts with 3 photos. 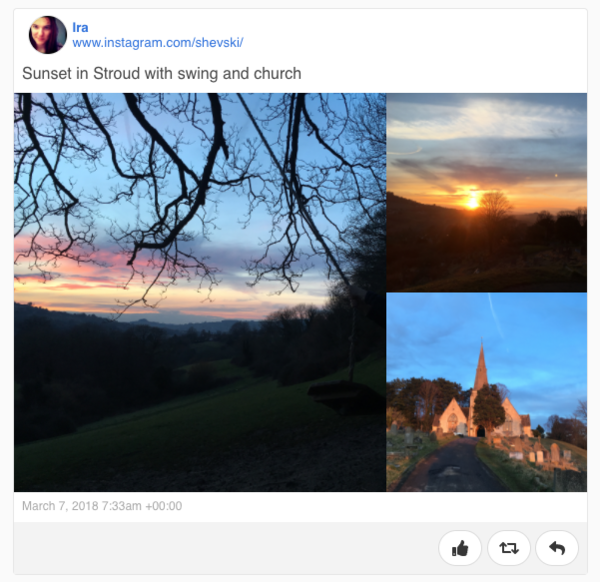 Instagram added support for posting multiple (up to 10) square-cropped photos and videos in a single post as of 2017-02-22, as of 2017-03-10 (at least), allows person-tagging per photo in the multi-photo, as of 2018-08-29 allows broader aspect ratios per post (all items in a post must be same ratio). The description below may be historical only. as of 2017-03-10 (probably earlier), at least on web, the individual photo permalinks now redirect to the multi-photo permalink. Each photo or video in an instagram multi-photo has its own shortcode hidden in the Instagram#Unofficial embedded JSON. You can use them to get permalinks for the individual photos and videos, where you can comment and like them separate from the multi-photo, both on web and in the app. These individual photo/video pages aren't accessible through the web or app UI otherwise, so they seem to be an unintended implementation detail on Instagram's part. However, once you've liked an individual photo/video in a multi-photo, you can get to it in the app via "Posts you've liked." For example, looking at the announcement multi-photo, the first individual video and photo are https://www.instagram.com/p/BQ0lyx9APPC/ and https://www.instagram.com/p/BQ0ly-bgMry/ , respectively. ... more URLs to examples of multi-photo tweets needed! Swarm sort of supports multi-photo posts as a secondary aspect of their checkin posts with up to 7 photos! See: checkin#Swarm for more details (since that's the primary post type supported by Swarm).